My daughter and I have been researching our family history for several years. We have made notable discoveries, and hit some dead ends. Although the process has had its ups-and-downs, ultimately we have found that connecting with past generations in this way is a truly enriching experience. Of course much of the technical research can be done on-line, but what inspires us to continue are the stories we discover when we visit the places our ancestors lived. Three summers ago we visited in Manchester where my mother’s side of the family settled after recent immigration from England and Germany. With the assistance and support of the Manchester Historical Society we found our ancestors to be prominent families with, for the most part, well documented lives and accomplishments. Our research in Manchester centered on Frederick John Bendall and Eleanora Bloom Bendall (my grandfather and grandmother) and the ancestors that came before them. My grandfather was Purchasing Agent for Cheney Mills, during their heyday. Charles Bloom, Eleanora’s father, was a prominent builder in town. Last summer we visited Ashford and Ellington to research my father’s side of the family. We found them to be more agrarian, less well-to-do and less well documented, but fascinating. Our focus was on John Swift, my great-grandfather. With the help of town records we pieced together his story. John was a farmer who lost his first wife, his infant son, and his 2 year old son within a 10 day period in 1872. One can only imagine the sorrow he endured, but John persevered, moved to Ellington and married my great grandmother, Ellen Slater Swift. He died at 36 and is buried in Ellington. Our on-line research told us the Swift family roots were in Mansfield, so that became our destination this summer. We contacted the local historical society and were referred to the curator of the Mansfield Historical Society Museum and Library. The curator set aside folders on the pertinent families (primarily Swift and Barrows). Perusing the material we came upon a hand-written letter dated 1769 from my 5X great grandfather (Thomas Swift, Jr. – John Swift’s great grandfather) to my 5X great grandmother (Mehitable Barrows). Mehitable had learned of Thomas’ bout with consumption, and he is warmly reassuring her that all is well. 10 months later they were married. The letter was saved and cherished by Mehitable, handed down through the generations, and eventually found its way to the Mansfield Historical Society. That, in and of itself, is a remarkable story! On-line research is fantastic and convenient. But for me, walking the land my ancestors walked, and discovering the stories of their lives, has provided an intense connection I would have never have experienced otherwise. The treasures that our ancestors pass down, and our local historical societies preserve, are priceless. My sincere thanks go to all of the kind and generous people who have helped us in our search: members of the Manchester Historical Society, the Ashford Historical Society, the Elllington Historical Society, and the Mansfield Historical Society, and the town clerks, librarians and curators from the various towns we have visited along the way. My interest in genealogy started with something as simple as a picture. A girl stared back at me with the same round, dark, serious eyes as mine, the same oval face. She was dressed in a beautiful dress that reminded me of my favorite movie (Anne of Green Gables) with a gorgeous velvet hat (later discovered to be a relic of the Cheney Silk Mills). I grew up feeling secure in my father’s family tree and proud of it. Fisherman that settled the area I lived in, German’s who immigrated to America before World War II. Stories that were passed down generation to generation were frequent and the history of my legacy surrounded where I grew up. My mother knew less of where she came from. Only where she grew up (Storrs, CT) and who her immediate family was. My mother was a mystery that I had to solve, inspired by a beautiful photograph of her grandmother, my great grandmother who was born in Manchester, CT in 1883, who had an amazing life that included a trip to France in 1921 aboard a ship. 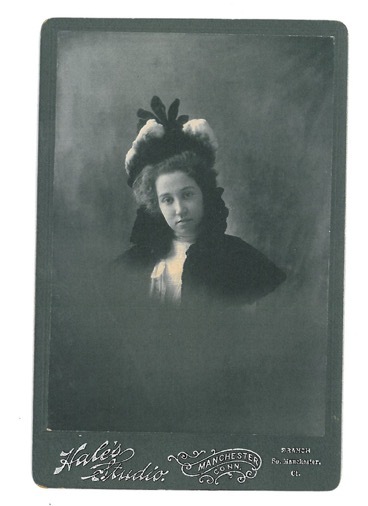 However, this particular story is not about Eleanora Marjory Bloom Bendall, merely inspired by her photograph. My mother and I are by all means no experts in genealogy. After four years of research, peeling back the layers of the Powers family tree, we still make rookie mistakes and often are just continuing on the road of discoveries led by instinct instead of proven methods of research. Luckily, my mother is a librarian and has been able to make a number of connections with Historical Societies, historians and genealogists that know what they are doing and have opened many more doors for us than what we would have ever discovered with internet resources (though helpful and powerful in their own right). One year ago I went on the internet, set on discovering more information on the Swift Family. My mother and I had just returned from a trip to Ashford, CT. With the help of the Historical Society and Town Hall we discovered the traumatic yet provocative look into my 2x great grandfather (John Swift) and the tragedy he had endured on the road to meeting my 2x great grandmother (Ellen Slater). The story couldn’t end there! With my preliminary internet research I found myself enthralled in the online resources that Mansfield, CT provided. After hours of research, I was finally able to track my 3x great grandfather (Experience Swift, previously unknown) and after a few more hours discovered roots that date back to 1545. Yes, we have been extremely lucky. The Swift’s story opened to us with the support of the Mansfield Historical Society. We thank them for preserving our history. One year later, having hit several brick walls, my mother and I decided to make another trip to Connecticut. This time to the very town she called home, Mansfield, CT. We’d been back several times in my life to walk in my mother’s shoes. To see the house she grew up in, set back in a forest of hard wood trees. To shop at the Hoot, which my mother was thrilled to find still existed! To visit her parents, who are laid to rest on a large hill overlooking the town they called home. This time we went back to walk in the shoes of our forefathers. Without the documents this society has painstakingly saved, preserved, archived and transcribed to the internet, our research would have been more difficult and more than likely not as fruitful. An original love letter written from my 6x great grandfather to my 6x great grandmother would have been lost. The discovery of this letter lent context and meaning to our search. We’ve met many kind people along the way who have helped us research and uncover lost family secrets. Ann was one of these people. She took time to collect as much as she could find. She was kind and patient, sitting back while my mother and I excitedly flipped through it. As the years go on, my mother’s family’s secrets have lessened. We are Irish immigrants, forced here by the famine. We are German immigrants, looking for freedom. We are witches whose lives were saved merely because the trials were ending, pilgrims searching for religious freedom, settlers finding a place to call home, and farmers tirelessly tiling the land. With that, we are truly American. I am happy to share that the genealogy hunt never ends. As we set on the road to discover more, to meet more people, to walk in others shoes, we will never forget the people who have helped us along the way.